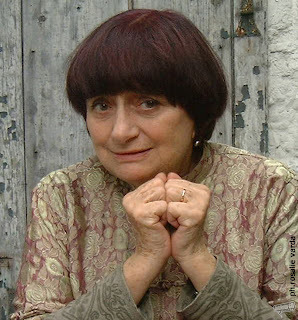 As Piers Handling characterized Agnès Varda for her most recent film Les Plages d'Agnès (The Beaches of Agnès), which premiered at the 65th Venice International Film Festival and then continued to the 33rd Toronto International Film Festival, Varda is irrepressible, enquiring, and an evident force of nature who even at the age of 80 shows no signs of slowing down. 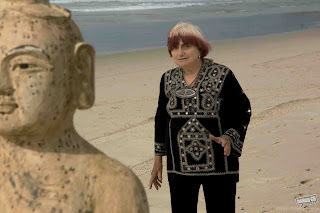 In her essayistic self-portrait documentary, Varda commences with the poetic assertion: "Si on ouvrait les gens, on trouverait des paysages. Moi, si on m'ouvrait, on trouverait des plages. [If you opened people up, you would find landscapes. If you opened me up, you would find beaches.]" 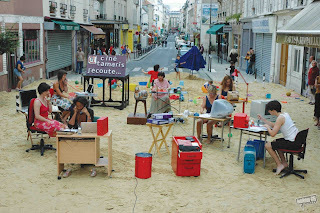 One day while on the beach in Noirmoutier, Varda realized how many other beaches had influenced her life and how these beaches could be used as the thread to connect her descriptions of family, friends, and career. Staging herself among excerpts of her films, images and reportages, profiling her beginnings as a stage photographer working under Vilar at the Festival d'Avignon and then as the official photographer for the Théâtre National Populaire, her early filmmaking as part of the Nouvelle Vague, her life with Jacques Demy, her feminism, her coverage of China in 1957, the Cuban Revolution in 1962, and the United States during the years of the Vietnam War, her life as an independent producer, and her family life, Varda has assembled a fascinating documentary; a wind-shifted mirror which creatively reflects her own fascinating personage. With generous candor, she responded to her TIFF08 audience about her latest creative endeavor. Why the usage of mirrors in the film's opening sequence? You know, it was easy to start with mirrors because the cliché of the self-portrait is to look at yourself in the mirror. I was helped by two things: first, the wind—which was a gift and made the scene for me because I could hide behind my scarf—and then all these mirrors that the kids helped me bring to the beach. By making an installation of mirrors on the beach, then it's not just the mirror in which I look at myself but mirrors that reflect the ocean and other people working with me. All these mirrors was how I wanted to make the portrait, split in many places and showing more people than me. I'm there a lot but I try to escape the mono-portrait to have other people surround me who become more important. I like the idea of digression, escaping the portrait, even though it was the subject. Did the film change in focus from your initial concept to its eventual execution? It's true that I did know exactly where I was going. What changed the direction of the film is that it took a long time to make—one year and a half. By doing it little by little, building it, my point of view changed. I wasn't shy at the beginning. I made it straightforward, more like a curriculum vitae in a way. Then I thought I should involve myself more—not too much in terms of saying things that people didn't normally know—but, being much more—how can I say?—part of the process, which came by chance all the time in the way I picked scenes from my films out of their context. I found images I had not found before. By just finding these images little by little, they would give me ideas. Another thing that happened totally by chance was that—when I was invited to Los Angeles—in my room there was a man who was there to give me acupuncture or something and he kept staring at me so I thought, "I have to take him on the beach." Everything got built little by little and by chance, by opportunity, by things that I found, or people I met. I had to do it that way because I tried to make it become my life by making it. I would say I remembered why I live. I lived by remembering all these months. Along the way I had a wonderful crew of young people who were so enthusiastic about the film that it gave me patience, because the film was technically difficult. We had images of Super8 and 16mm films and digital material, we shot in HD and other sequences were not in HD, there was this mix of techniques which was difficult to put together while I tried to keep my daydreaming through which I could free associate. In France we have a game where we make a chain of vague inspirations, sometimes memories. Also, one of the big inventions of life is to live with somebody, to make a couple, and that was part of my project: to show how a relationship has to go up and down with a wish of aging together, which also was a project that I couldn't finish and achieve. There was a kind of frustration in that one; but, I'm not a frustrated person, that's not my point, so I tried to keep alive what is life, I would say. Why do you show your friend Chris Marker as an animated cat? He decided one day that he didn't want to appear anyplace. Nobody can take pictures of him. He decided he wanted you to imagine him. At the openings of his films, the cat is at the theater. He made this choice and I like it. I like Marker very much. Why the circus performers on the beach? It was one of my daydreams. I love the circus. I love trapeze artists. I love them. Always in the circus, there is a background that is fabric or plastic or something and I thought, "Wouldn't it beautiful if we could watch them but also see the ocean?" We had to build a tower high enough to film them and the ocean. It was a big organization. It wasn't just like that. Even though I hope it looked like it just happened to be there and they just happened to be flying through the air. It's a daydream. When I was young, I wished to be in the circus. And the house of cinema? This house was made up of the reels of film from Les Créatures, in which Catherine Deneuve acted, and which was a failure. I had all these reels of film. When a film doesn't work, you have all these prints, big prints with seven reels, and as an act of gleaning I thought, "I should do something with these." It came into my mind that it would be beautiful to make a house of cinema made from cinema. It was a childhood feeling that it would be nice to live in a house which is cinema. So with Christopher Vallaux, the designer of my exhibition and my installation, we built the frame of the house and then we had the crew hang the strips of film so they would become walls. Were they not beautiful walls? Was it not a dream house? Can you speak to your repeated usage of installation pieces throughout the film? I've been starting to make installations. They give me great pleasure. You saw some of these installation pieces in the film. I think I am being drawn more to installations than film, or rather installations that include film. Maybe I will switch completely? I don't think so because I really like to film other people. As a woman, how do you combine all your various lives as lover, mother, artist? Please. Forever there has been this question. Combining means that you just decide that you do not want to give up the creation and the work; filmmaking in my case. I was a photographer already at the time that I decided to become a mother. I had to work. But I never quit the idea that I wanted to have a private life and a family. I just decided not to quit. All the women who work and are artistic, they have to make the decision not to quit anything. Sometimes you have to be a trapezist and an acrobat. How have you maintained your creativity throughout the years? I kept in a good mood. The desire to enjoy myself sometimes, I must say; but, the part I like the best in the film is when I put on the potato costume. I like to make a clown of myself. I've always liked it. I'm supposed to slow down, but I don't. What was difficult about this film? When it deals with things that are personal; the loss of somebody. It was like when I was editing Jacquot de Nantes, which was right after Jacques Demy had passed away. This film was 18 years after but the loss is still very strong, which has been difficult. To decide to make it that way. To try to find simple words and try to make it strong for me and—I hope—it goes through the audience and people can feel it. That was what I wanted to share. Also because many people I know, cinephiles, they love Jacques. Feeling something about somebody you knew is difficult. Was it hard to know when the film was complete? It's so difficult that I think I have to continue the editing because I'm not totally satisfied. When you have a story, you go with the story and try to make it understandable, or mysterious, and find an end. But this is like a free market and then you have to get it together to make a film. I think I would take things out. I need to have a sort of side film that I would like to finish with things more in digression, I don't know. It's so far in my mind that I'm not sure it's finished. But I had to stop somewhere to show it. It was just finished for Venice and then Toronto, these two festivals, and now I will go back for a little more editing I think. So you will be editing the film some more? I think the film is so clear, I said so much, I told so much, what could I add? But to answer your question, I will change something: the little addition of the birthday party really should come much earlier in the credits. I don't want to oblige people to stay for all these endless credits because we want to thank so many people. If I keep the birthday party, I will bring it near the beginning of the credits. This is a change I have to make. You've been responding to questions about your film; but, do you have any questions about your film? The answer would be yes. Are there some parts of the film that are boring to the audience? Sometimes I'm afraid that it's too long. They always tell you that you have to make a film that is only 100 minutes, that 100 minutes is the best, and that if it goes over 100 minutes it will become tiring, even though we know beautiful films are often long. I'm afraid to bore people. I always have the feeling that I should be careful. I don't know about some of the shots. 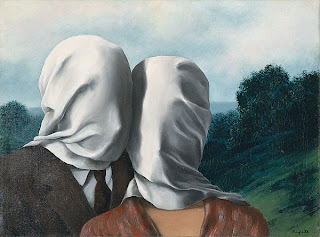 When I made the shot of the naked people that started as a painting of the lovers by Magritte, I thought of that shot as being interesting and strong but then some people said that shot would make it difficult for the film to be shown in the United States [the male is shown with full frontal erection]. I don't know. The film has not been shown before a regular audience yet. It's only been shown to festival audiences. I want people to let me know what they think about the film, if it's too short, too long. I'm still questioning the film itself even though I've worked on it a long time. It's a quest for something and I've tried to find a balance between emotion and art, and between disorder and structure. 10/17/08 UPDATE: An abbreviated edit of this entry has just been published in movieScope 2:4. I love Agnes so much, this was great to read. I could hear her speaking in my mind. thanks! Debbie, how delightful to have you stop by to comment. I'm glad this entry brought some good feelings. How's cinema down under? Cinema down under is pretty darn glorious. There are so many festivals I can't get to them all. Most of the time I just go to the close by Dendy, which is the art house circuit. Today I saw The Tender Hook -entertaining- and yesterday I saw Waltz with Bashir - fantastic and depressing.I might go see In Bruges and maybe Not Quite Hollywood. Anyway, a wealth of film here, and I am seeing a lot. The Queer doc fest just ended. When you are ready, we have space for you! Your blog is fantastic.I usually read it through bloglines.